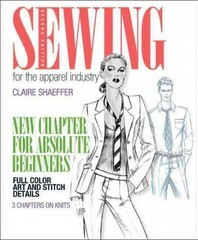 Sewing for the Apparel Industry 2 Edition Sewing for the Apparel Industry, Second Edition, focuses on the fundamental principles of garment construction, the interrelationship of assembly methods, and the elements which the designer must consider at the outset of individual design creation. It details easy-to-master production operations, while emphasizing the equipment, practical skills, and sewing processes used in apparel manufacturing. Efficient and cost effective procedure descriptions complement material on the basic concept of design and desired quality, providing students with an understanding of various production methods and how they affect design decisions and relate to garment quality and labor and material costs.